Tumbling Tom Yellow tomato is cousin to Red Tumbling Tom and one of the newer varieties of edible ornamentals to hit the market. It’s a great choice for small space gardens, urban balconies or any other bright, sunny setting. This plant is determinate, meaning it will stop growing at a certain point, and has a weeping habit so it’s an ideal plant for hanging baskets. 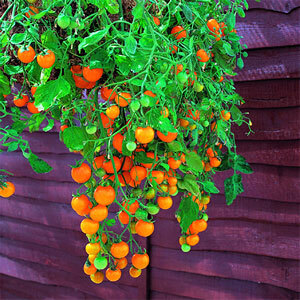 It hangs about two feet over the sides of tall containers, window boxes or hanging baskets. Beautiful white blooms precede masses of golden yellow, 1-2 inch round fruit. This plant is well branched and vigorously productive. Place several plants in one container, allowing six inches between plants for a full look and lots of tomatoes. For a highly ornamental look, alternate with Red Tumbling Tom, with bright red fruit. Start plants indoors from seed, 5-6 weeks before the last frost date. Once the danger of frost has passed and night temperatures are consistently above 55 degrees, plant outdoors. Plants will mature in about 70 days from setting out seedlings.